It’s so great to be back to Ice Cream Tuesdays again! And for this go-round, I’m focusing all on no-churn options. While I love my churned bases, not everyone has an ice cream maker, so no-churn is the great equalizer. If you’ve never tried it, give it a shot. There are tons of recipes on the Internet, or you can start with my Andes Mint Chip Ice Cream. 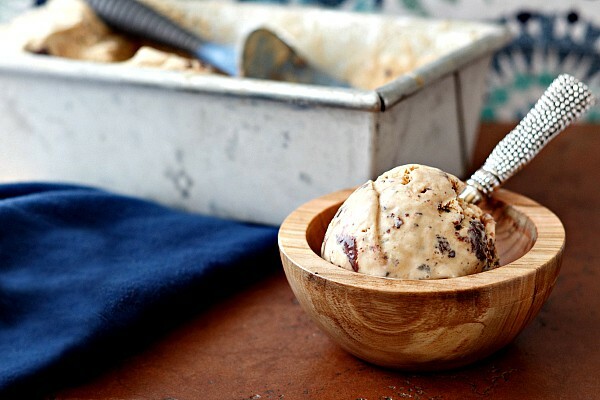 Now, get ready to make some Salted Caramel Turtle Fudge Swirl Ice Cream! 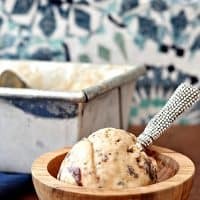 Salted caramel turtle fudge swirl started out with a simple idea, and one that I’m sure isn’t original: if no-churn ice cream is made with sweetened condensed milk and heavy cream, why not swap out the scm with a can of dulce de leche? So that’s what I did. Before I go any further, let me remind you how freakish I am about caramel and butterscotch. About how they are two different things and that butterscotch, real butterscotch, is every bit as delicious as caramel. I generally make dulce de leche by submerging a can of sweetened condensed milk in boiling water for three hours, but this time, I just went ahead and bought a can. I was all excited, but what I found when I opened the can was something thinner even than condensed milk and a different color–darker–than the dulce de leche I’m used to. And when I tasted it: fake butterscotch. Still, since I had it, I used it. I am working on an ice cream for next week though that is based on homemade dulce de leche. I will link to that one when it’s up because I will be playing with proportions of cream to dulce to take into account the super-thickness of dulce de leche. 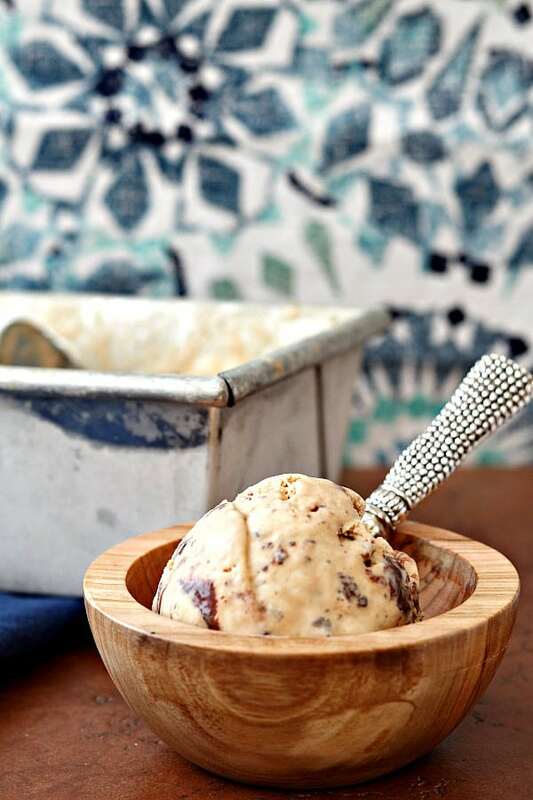 At any rate, I submit that this salted caramel turtle fudge swirl ice cream is still really decadent and delicious, so I’m going to tell you how I made it. Just know that you’re really having something more akin (in flavor anyway), to butterscotch. You’re still gonna love it. So, let’s make some, shall we? 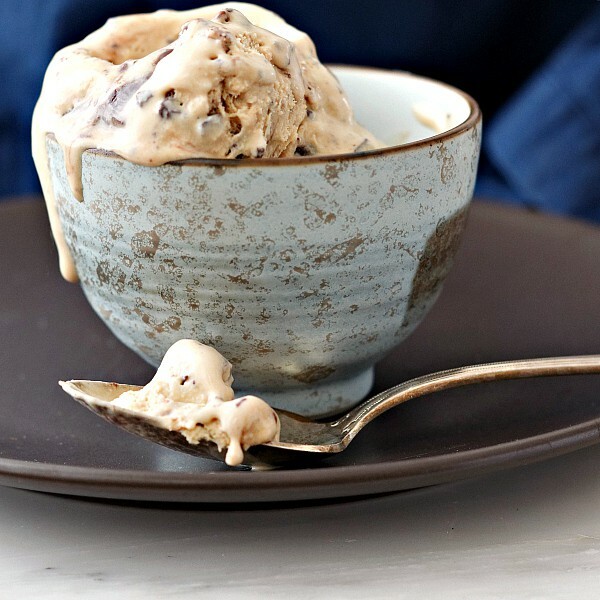 This Salted Caramel Turtle Fudge Swirl Ice Cream is decadent, creamy, and delicious. Prepared in ten minutes, it's ready to eat once completely frozen, about six hours. Combine all four ingredients in the bowl of your stand mixer (start with the lesser amount of salt) and whip just until the base thickens and mounds in the mixer. It does not need to come to "peaks," stiff or otherwise). Very quickly whip in the chopped candies. Fold to distribute them throughout the base. Layer 1/3 of the ice cream base in a loaf pan (or similarly sized pan). Drizzle on 2-3 Tablespoons of the hot fudge sauce. Layer another 1/3 of the ice cream and 2-3 more Tablespoons of the sauce. Finish with the last of the base. You can also add a bit more fudge sauce to the top. Cover with plastic wrap and freeze until completely firm, about 6 hours. Leave the base vanilla by using sweetened condensed milk rather than dulce de leche. Reduce the salt to 1/4 teaspoon. If you like your ice cream extra nutty, mix in some toasted, chopped pecans along with the chopped turtle candies. Also feel free to substitute the fudge sauce with caramel sauce if you prefer a caramel swirl. And there you have it. One delicious-as-it-is salted caramel turtle fudge swirl ice cream, and a couple of ideas for variations as well. Nice! What would you like to do now? 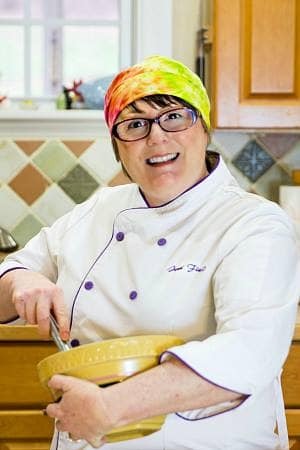 You could always check out my page on ice cream gear, from ice cream makers to bowls to scoops! My favorite ice cream flavors all in one!! And no churn which is magic in this no-ice-cream-machine friend’s book! Delish!